Crack this case and win Rs 25,000! 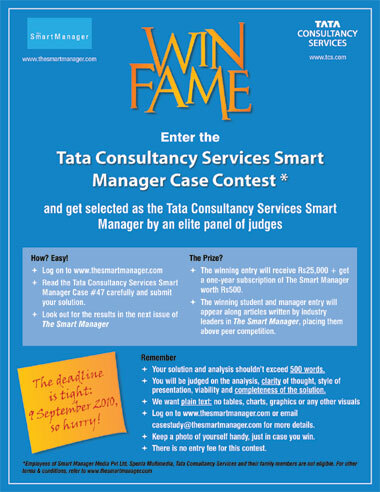 The Tata Consultancy Services-Smart Manager Case Contest is the oldest and most prestigious competition of its kind in India. Apart from a one-year free subscription to The Smart Manager, India's first world-class management magazine, winners from the 'manager' and 'student' categories stand to win cash prizes of Rs 25,000 each. All you have to do is read the case, see the question you have to answer on the last slide, click on The Smart Manager logo below, and post your solutions by September 9, 2010. All the best! Ram Pendharkar, his brother and director of Pendharkar Dairy, had just emailed him a copy of the India Food Report 2010, and the findings were dismal. 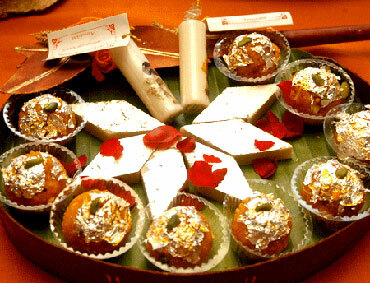 Their arch rivals -- Delhiwallah's -- had once again outwitted them to emerge as leader in the organised sweets and snacks market. This wasn't the first time they had done it either. What's more, the report hinted that they'd also managed to grab a significant chunk of the global market for Indian sweets and snacks. Pacing up and down his cabin, Bal wondered as to what it was that consistently kept their competitors ahead of them. He could see, in his mind's eye, the Pendharkar Group's entire career graph meandering in front of him. 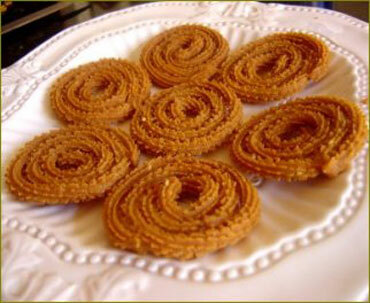 From humble beginnings which saw chivda, chaklee (snacks) and amba barfee (sweets) being prepared by hand by the womenfolk of the Pendharkar family from the confines of their homes, Pendharkar Bros had metamorphosed into a household name not just in and around Shejvi but across their native state, Maharashtra. Click NEXT to read what the case is about . . .
Sweet Salvation: What should the Pendharkars do? Shejvi, of course, remained the principal manufacturing unit, with two automated manufacturing lines devoted to the manufacture of Pendharkar Bros' famous chivda. The inspiration behind venturing into the food business had come from Bal's grandfather, the late Dattatraya Pendharkar, who started a dairy business (Pendharkar Dairy) in Kolhapur in the 1930s almost single-handedly. And it was his eldest son and Bal's father, the late Vinayak Pendharkar, who started Pendharkar Bros in Shejvi in 1950. Public demand dictated that another shop be opened, and soon enough, another shop was indeed opened in a prime city location. 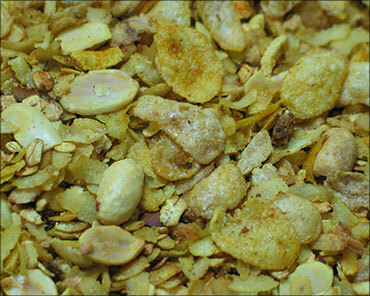 While the products remained the same: chivda, chaklee (snacks) and amba barfee (sweets), great care was taken to ensure quality, hygiene, and above all, fair pricing. Needless to say, people flocked to these shops in droves, and as the Pendharkars fathomed the gravity of the situation, they realised there was no way they could meet the growing demand for their products; not with the existing scale of operations at least. What followed were a couple of desperate measures, including increasing the production of chivda and introducing a random chit system to contain demand. When all tricks failed, Bal and his father found themselves travelling extensively to a host of food and beverage exhibitions in England and the United States. At one such exhibition in Los Angeles, they chanced upon a machine that efficiently churned out cream donuts, a favorite breakfast food with the Americans. Bal's father was quick to cash in on the opportunity, and after much deliberation, convinced one of the suppliers to visit their factory in India to design a similar machine which would ease the manufacture of their main product -- chivda. That's how automation entered the hitherto simple lexicon of the Pendharkars, albeit at a steep price of Rs 1 crore (Rs 10 million), definitely a huge investment in the 1980s. And if the Pendharkars thought they could reach breakeven point within a year, the machine helped them reach their goal for it produced a good 350 kg of chivda per hour, sufficient to meet the inflated customer demand. With further expansion came newer, more complex challenges. One such challenge came in 1995, when Pendharkar Bros decided to streamline their transactions and billing process. The result was the implementation of the then unknown RFID system. The way this system worked was that customers were given RFID plastic cards on entering the shop. Small machines were kept at every counter and the cards were fed with the prices of various items bought. Finally, the cards had to be redeemed at the cash counter by paying up the total amount for all purchases. The nineties were also the time of the dot-com boom and the freeing up of the Indian economy from the shackles of protectionist policies, among other things. It came as no surprise then that these innovations created a great deal of curiosity and demand around the products of Pendharkar Bros.
All along, Pendharkar Bros had looked toward Pendharkar Dairy, not only as a source of inspiration for their business but also as a very real source for all of their dairy supplies. Till 2005, the dairy operated ten physical servers across two data centers in a town nearly 500km from Kolhapur. This was proving to be costly besides posing a major risk to operations. Meanwhile, Bal's brother Ram discovered that while it took about six to seven hours to fully restore a corrupted server, using VMware High Availability brought down the time taken to a mere ten minutes. So, in 2005, they decided to implement VMware server virtualisation, and within a span of two years, were able to bring down the number of physical servers to just three, that too operating out of only one data center. The adoption of IT further benefited their business. It reduced server hardware acquisition costs by 50% and software acquisition costs by 75%. Server deployment times were reduced from three weeks to just three hours. Making do with only three physical servers and one data center translated into a 50% reduction in power, cooling and real estate. A sharp sound interrupted Bal's quiet reverie -- it was his mobile phone. Even as he floated aimlessly toward the phone, it stopped ringing. Once again, his thoughts drifted to the Pendharkar story -- to the present. Having started almost as a cottage enterprise, Pendharkar Bros had now reached a stage where they were operating out of three manufacturing concerns: one in Shejvi; another in Chiplun, under the name Annapoorna Sweets and Snacks Private Limited; and the third, by the name Shreeram Food Industries, in Pawas. 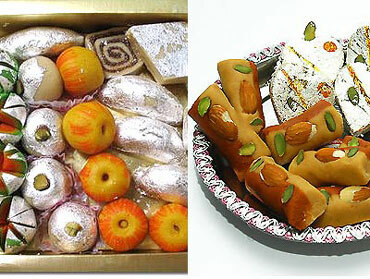 Each manufacturing unit was equipped with state-of-the-art machinery for the production of sweets and snacks. Special machines had been imported from Japan for the manufacture of sweets. Meanwhile, the Shejvi unit exclusively manufactured Pendharkar Bros' monopoly product -- chivda. All their dairy supplies were procured in-house from Pendharkar Dairy, which produced up to 200,000 litres of milk per day, along with milk-based products such as cream, butter and yoghurt. And the focus continued to be on quality, with the entire business activity HACCP (Hazard Analysis Critical Control Points) certified. Apart from the manufacturing units, Shejvi was now home to two modern outlets, selling nearly 56 different varieties of sweets and 31 varieties of snacks. The shops forecasted demand for the next day by 5 p.m., and accordingly, at 5 a.m. the next day, sweets and snacks were delivered to them. A fleet of 13 small and medium vehicles took care of transportation in and around Shejvi. Being a family-owned and managed business, the Pendharkar's took minimal recourse to advertising, save for word-of-mouth publicity and the local newspaper. New product development usually happened from home, and these new products were introduced into the system only after customers and other family members tested them. Distribution-wise, there were ten franchisees in Shejvi, helped along by a wide network of authorized agents and distributors across India. Thanks to their tie-ups with various corporate and non-corporate entities, Pendharkar Bros were now counted amongst the major suppliers of sweets and snacks within the country. Slowly but surely, they were also paving the way toward becoming a major exporter of these products abroad. In fact, exports had already started to countries such as the US, Singapore and Israel. By themselves, Pendharkar Bros were but a part of the larger and prestigious Pendharkar Group, which had interests in various sectors including food, dairy, agro and digital. Indeed, the Pendharkar Group comprised several companies, ie, Pendharkar Dairy, Pendharkar Foods, Pendharkar Agro Industries Private Limited, Pendharkar Digitals and of course, Pendharkar Bros. While each of these businesses had their own production, marketing and distribution networks, the internal synergies were put to collective use from time to time so as to improve efficiency of business on the whole. To put it in statistical terms, the current turnover of the Pendharkar Group was approximately $5bn; with $4bn from the dairy business, where profit margins are only about 2%, and $1bn from the sweets business, where profit margins are 12% to 15%. Once again, Bal's mobile phone rang, breaking his train of thought. It was his son, Ameya, calling to brief him about their recently-launched advertising campaign. "What was it that their competitors were getting right, which they obviously weren't getting right?" the question kept nagging him. Delhiwallah's -- their competitors -- were well known for their aggressive marketing strategy and extensive distribution network. Other rivals like Khavaiya's possessed many quality-control laboratories. Additionally, rumor had it that Indian dairy major, Milky Way, was planning to enter the country's already crowded $500mn sweets and snacks market. And just a few days ago, global retail giant, Big Buy, had announced similar such plans. Having reached the present level, what do you think the Pendharkars need to do to counter competition, especially the onslaught of new brand labels? Should they aggressively focus on expansion and on increasing their advertising spend? Click on the Smart Manager logo below to answer the question.